← Sensitive powers, ACTIVATE! Form of, Oprah! This week we're going to change up Versus a bit, and instead of asking who would win in a fight, I'm wondering which costume you like better. The guy on the left is Henry Cavill from the upcoming "Man of Steel" film, while the fellow on the right is Brandon Routh from the 2006 release "Superman Returns". Which do you like better? In terms of the actors themselves, I prefer Cavill. Routh's small chin and big eyes always made me feel like I was watching Anime Superman, while Cavill's got a more square-jawed, somewhat rugged look to him. So for me, I go Cavill all the way, but what would you say? Is Cavill’s suit made out of bubble wrap? It doesn’t matter because we as fans LOSE! None of its good. is “man of steel” a New 52 movie? If so, are the also going to re-launch the Batman films? Henry Cavill wins simply for not being Brandon Routh. Even with the still that everyone’s seen and the almost-trailer they came out with, Man Of Steel look so much better just because I don’t see it having an island made of crystals for no apparent reason. I could go into a big long hateful rant against Superman Returns, but instead I’ll just read everyone else’ rants. I like how Supe’s suit is not something his Ma Kent can just sew like back in the day. Now the Kryptonian couture reboots and reforms just like *Jem & The Holograms. Both are failures in my book. I prefer some aspects of Cavill’s. But, why is the outfit a onesie? They should have continued with the belt just to have a visual break from the top and bottom. Now it just looks like he is wearing a diving suit with extra decoration. I never got behind the red underwear on the outside for the original outfit. The red underwear look worked in the 30’s because it was based of what circus strongmen wore and therefore communicated Superman’s power. Now, however, it just looks silly, which is why the New 52 and Man of Steel have moved away from it. And i agree. i do think the belt he has in the comics looks better than the decoration on the Cavill’s suit, but the design still serves the purpose of breaking up the blue. Aside from that the squared off neck line and shoulder attached cape look good to me. So between these two i have to side with the majority, the Cavill suit is the better. Dr. Shrinker: Is Cavill’s suit made out of bubble wrap? Yeah, I guess I like more elements of the Henry Cavill costume, but the belt on Brandon Routh’s costume is pretty sweet. But overall, Cavill’s costume does look much more modern. I’m not going to comment too much on the actors themselves. I’ll admit that Superman Returns was pretty bad, but I’ve seen Brandon Routh in other things, and he’s not that bad an actor. Dang. A bubble wrap costume would really rock! Or. at least, pop. routh was fine as superman. wasnt his fault that movie sucked. i like the cavill suit. looks different than whats come before. cavill has a good build, looks the part face-wise. he lost batman begins to bale and lost casino royale to daniel craig. thats good company. this movie should be fine and is gonna open up the dc cinematic universe. The red underwear look worked in the 30′s because it was based of what circus strongmen wore and therefore communicated Superman’s power. Excellent point. Almost every costume of every superhero (and supervillain) changes with the times even if subtly. Look at the various incarnations of Batman and Spider-Man. I think Stan Lee said that he consciously chose “Spider-Man” over “Spiderman” just to differentiate him from other heroes. The Cavill suit reflects a change in persona. More stylized and foreign because it was designed by an alien culture, perhaps with exotic materials. It really changes how you look at the character. The most notable change that I see is on both costumes. The “S” logo is more abstracted. You still recognize it as a Roman letter. However, it hints at being from another alphabet or something along the lines of a hieroglyph or rune. Not a big Superman fan myself, but insomnia has introduced me to “Smallville.” I don’t know what season TNT is running. Liking it so far. Didn’t we have this contest a while ago? Anyway, my vote is for Superman Returns but neither wins in terms of color scheme. The blue is too light, the red is too dark, and the yellow is too dull. NOTE: I’m referring to the colors seen in the actual films/pictures. These two were edited to be better color-wise. I like that the Cavill costume is moving TOWARDS some thing, But it is not there yet! I like that It looks like he has gloves, However I want the logo to be closer to the 80’s version and I want the belt! Can we morph the 2 together? Crap, you’re right on all counts, Debochira. This will teach me to think of these at the crack of dawn. It’s a draw for me. I prefer the textured look of the new one, but it’s a little pointlessly busy around the lower back. I prefer the overall lines of Routh’s suit. And Brandon Routh got screwed. He wasn’t allowed to play Superman, he had to play Christopher Reeves playing Superman while people still remember what he actually looked like. And don’t get me started on that script. Brandon Routh got screwed.He wasn’t allowed to play Superman, he had to play Christopher Reeves playing Superman while people still remember what he actually looked like.And don’t get me started on that script. you are correct sir. and we need to see the new suit in action. the plane crash scene in SR is incredible. Most of the professional writing I’ve seen for big-house movies hasn’t been as good over the past several years. I’ve seen better dialogue, action scenes, concepts in general written by unpublished, non-established, unknown writers who can’t get a project off the ground. I would actually like to know the story on the costume before judging, because I LIKED Ma Kent resewing Clark’s baby blankets and needing his laser-vision to cut the thread. Don’t like either of them. Once it stabilized, Superman’s costume stayed essentially unchanged for an average human lifespan. Who the hell are these upstarts thinking they can improve on what dates back to the time of our grandfathers? I gotta go with Mashlagoo on this one. Make all the jokes you want about Supes wearing his underwear on the outside, but I think visually, you need that little splash of contrasting color around the midsection to mark the break between the upper and lower halves of the body. Otherwise it just looks like Superman is wearing a onesie, long underwear, or a union suit. We’ve gotten so used to seeing those red shorts that he looks weird without them. (Like a grown man in a blue suit and red cape doesn’t look weird to begin with, but you get my point). That said, I think Cavill looks physically more like what you want the Man of Steel to look like, so I guess I come down squarely on both sides of the issue :). Cavill’s costume is growing on me. It seems similar in texture to the new Spider-Man costume, but it looks better on Cavill than it did on Garfield. Here’s a bit of trivia: they were both born in ’83. I guess the military-style uniform makes more sense on an adult Kryptonian than on a human (albeit mutant) high-schooler. It also helps that you can see Kal-El’s face. @Rodimus Mike: If the photo you linked to is the “Real” costume, I like it even less than the shot Jeff posted. The blue looks way too dark and muddy, as if the suit really needed to be washed. 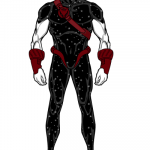 Why, for frak’s sake did The Powers That Be at DC decide that everything in the DC universe, including the characters’ costumes, has to be dark and grim and gritty? What happened to the quaint old-fashioned notion that comic books were supposed to be . . . oh, I dunno . . . FUN? Have these images been photoshopped? I seem to recall the colors on Cavill’s attire being more dreary, and lacking color on the waist detailing, while Routh’s attire sported a higher neckline on his super-suit. That being said, I think Cavill sports a closer physical appearance to the Man of Steel, although the makeup department seem incapable of reproducing the character’s iconing hairstyle. When they cast Routh they went with a guy who’d bear a ressemblance to Christopher Reeve, but while Routh bore a ressemblance, he didn’t have all the features Reeve had that made him such a Superman-come-to-life. However, I will say I still prefer Routh’s Superman costume. The higher neckline bugged me but it remained a bodysuit and little more, with the trunks and yellow belt adding a much-needed break of color to the midsection that both the MOS costume and New 52’s power armor (Man of Powered Armor over Man of Steel, I suppose) sorely lack. The Cavill costume just lacks in color, and is just a sea of dull blue with a red cape and red boots. It also appears to have molded muscle details on it which is something I don’t believe a Superman actor should ever sport. 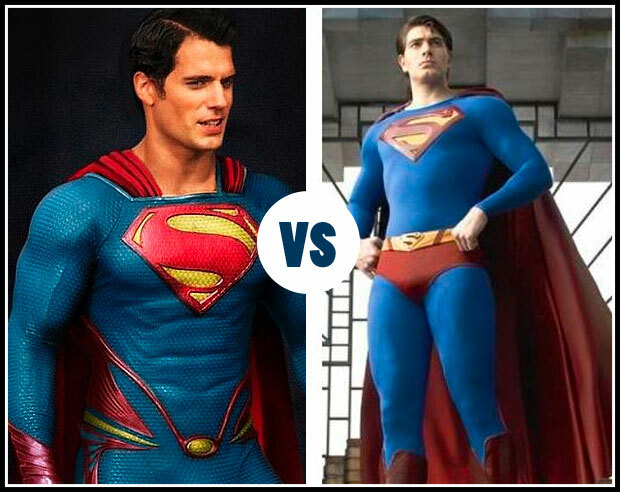 Cavill wins, The 78-80’s one I would’ve picked but the 06 one he has no definition to it and the S was too small to me. Which is why I picked Cavill.